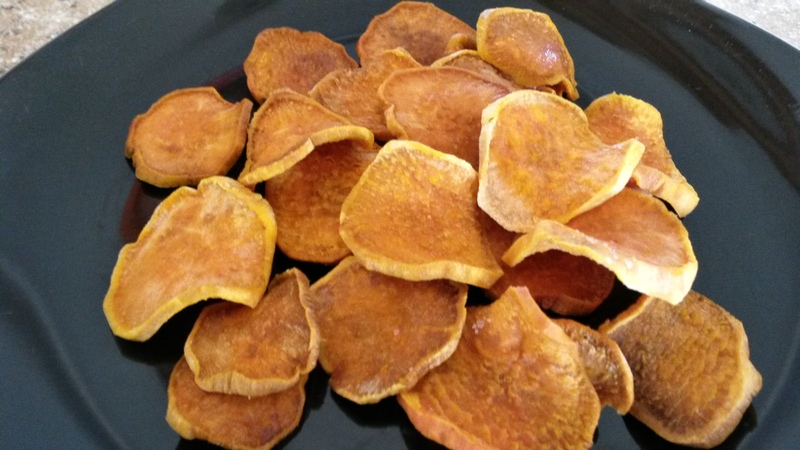 The kids and I love sweet potato chips, but I don’t like the price tag on those you find in health food stores. I figured that they can’t be that hard to make! I bought a bunch of sweet potatoes the other day. (Partly because the baby LOVES homemade sweet potato fries!) These do take some time to make and we tend to eat the pan as soon as it is out of the oven. Not sure how I will ever get enough to last a few days! At least I am happy my kids are eating a healthy snack! Peel and slice the sweet potatoes thin. Line a sheet pan with parchment paper. Place the sweet potatoes in the pan and brush lightly with olive oil and sprinkle with sea salt. Bake at 200 degrees for 2-3 hours, or until crisp. I love that fall is making it’s way back! It is my favorite season of the year. 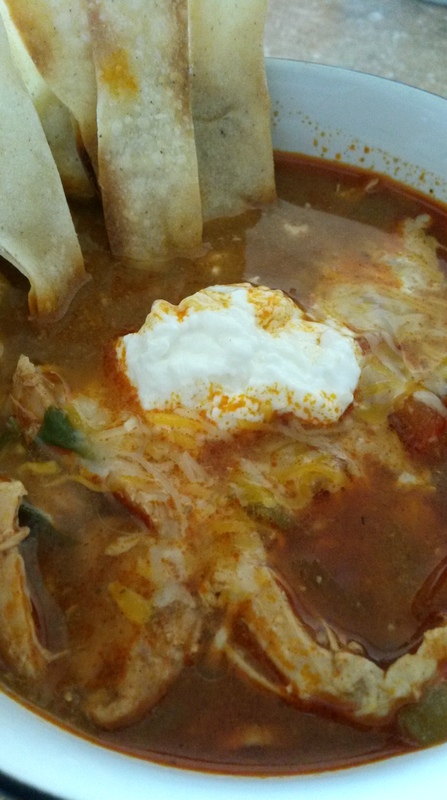 I also love that the cooler temps are perfect for a warm bowl of Chicken Tortilla Soup! My kids are not big bean fans, but they actually LOVED this soup. Maybe it had something to do with the homemade tortilla chip! 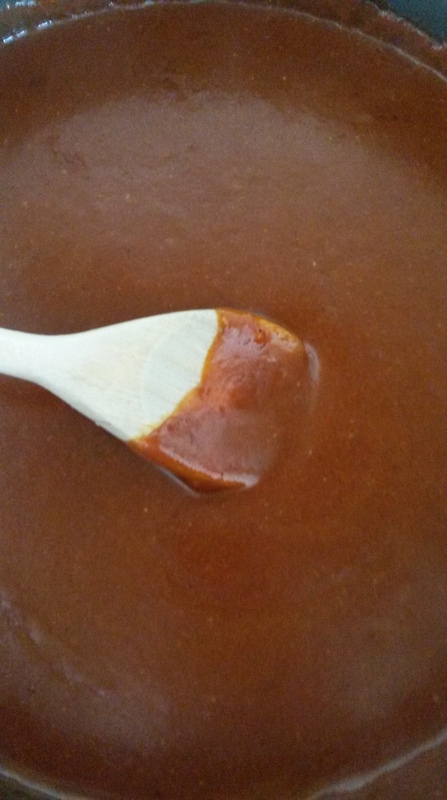 1 1/2 cups Homemade Enchilada Sauce, if using canned make sure it has NO sugar added or MSG! Place all the ingredients except the olive oil and corn tortillas in the crockpot. (I used frozen chicken breast without thawing) Stir and cover. Cook on low for 6-8 hours, until the chicken easily shreds with a fork. In the last hour of cooking shred the chicken and place back in the crockpot. Preheat the oven to 400 degrees. Line a pan with foil. Brush the tortillas with olive oil on both sides and cut into strips. Sprinkle with sea salt. Bake for 7-10 minutes until golden brown and crisp. You can garnish your soup with shredded cheese, avocado, or a dollop of greek yogurt. To make it into a freezer meal, just place the soup in ziplock bags once cooked. Lay flat and freeze. Then just thaw and place in the crockpot to reheat! I find that it actually had more flavor the second day! Since starting the my fitness journey I haven’t made enchiladas…well to be honest I haven’t made them in a very long time before that since my family doesn’t like the “spicy” sauce. So I decided to try to make a sauce that isn’t full of chemicals and wasn’t too spicy for my family. My first batch was a bit too spicy for their liking. Just adjust the seasoning to your families liking! I am excited that this sauce turned out just amazing! I like it a bit spicier than the rest of my family so I can easily make two batches to make everyone happy! It also freezes well, so I don’t need to worry about throwing out the extra! Heat the oil in a sauce pan over medium heat. Whisk in the flour and chili powder. Reduce heat to low. Add in the tomato sauce and water. Stir occasionally to prevent burning to the pan. Stir in the cumin, garlic and onion powder. 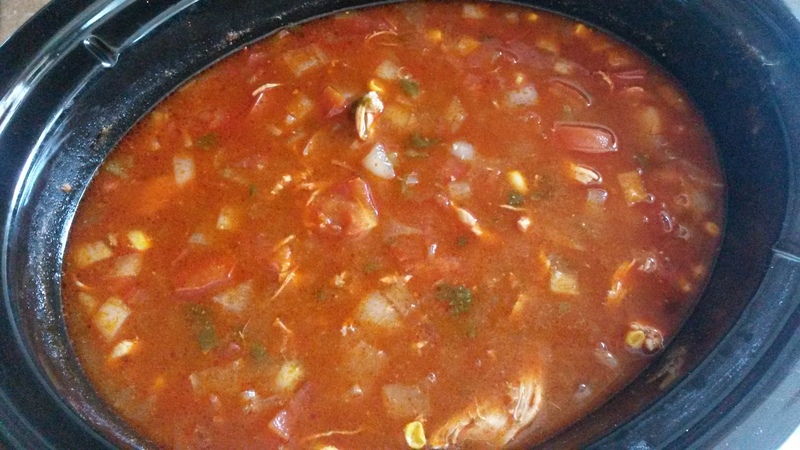 Sauce will thicken as it cooks, approximately 10 minutes. Add salt to taste. 21 day fix: For the whole batch I count it as 1 purple (due to the tomato sauce) and 10 tsp for the olive oil. Remember is you are using the full amount in a recipe, just divide these numbers by the total servings! I don’t know about you, but I LOVE everything about Fall! The colors, the smells, wearing comfy sweaters and slippers, anything pumpkin, and stews! 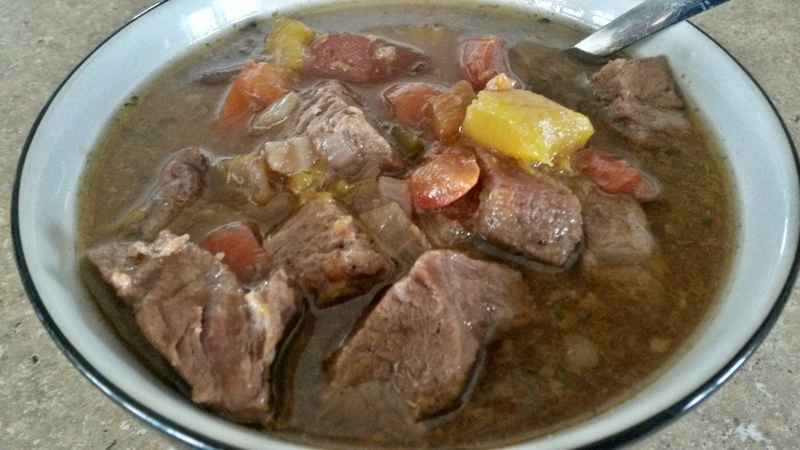 There is something warm and comforting about having a stew slow cooking all day in the crock pot. The aroma that fills the house is so inviting! Yes, I am a stay-at-home Momma, but my days are very busy with homeschooling the older three and trying to keep the younger two out of trouble! 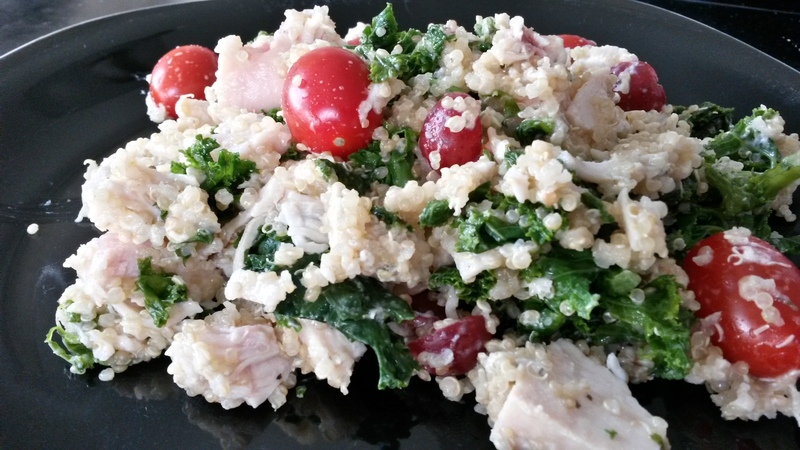 I love a quick and easy meal that is complete and healthy for my family! I know you will love this one too! Sometimes I add a little cabbage to the stew…it reminds me of the Beef Stew my Grandma and Mom made when I was little. Of coarse, we always had Grandma’s amazing dumplings too! Sorry, no dumplings today! Add the ingredients to the crockpot in order listed. To cut the butternut squash easily, I microwave it for about 2 minutes just to get the outside a little bit soften so I can chop it easier. (So I don’t chop off my hand!) Cook on low for 6-8 hours. Today is one of those days I really need an extra pick-me-up! The baby was up 3 times to eat last night. I was up at 6 to get in my Lower Fix Extreme workout! We just finished our day of school and I would much rather go take a nap than clean up the house and make some meatballs to put in the freezer. Well…I won’t reach my goals unless I keep pushing through! As Autumn says, “if you want something you’ve never had, you need to do something you’ve never done!” So despite wanting to just do NOTHING, I decided to make up a very yummy Shakeology treat! (I usually only have 1 coffee and 1 Shakeology a day.) With the fall drinks coming out soon at a certain coffee shop, I thought I would make a healthier version for us! I have to tell you this is AMAZING! You need to make this one! Put espresso, almond milk, water in blender. 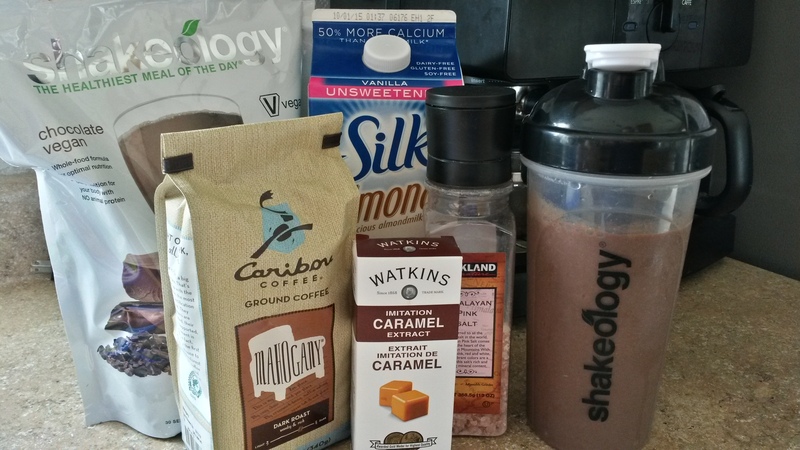 Add caramel extract, salt, and Shakeology. Blend. Add 1 cup of ice. Blend again until smooth! Enjoy! Want to order some Shakeology to make this? Order here! I bought a big bag of Organic Kale at Costco the other day. I was planning on just freezing portions in baggies to use in my Shakeology, but I decided to make a yummy salad for dinner! It was very good! Next time I will add some chopped onions and maybe add more grapes. 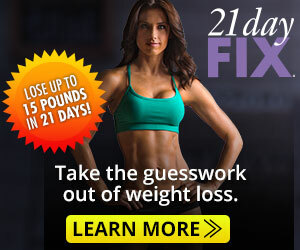 Remember if you change any ingredients be sure to recalculate the containers for 21 day fix! Mix all together in a bowl and enjoy! It was amazing both warm and cold!